Copyright literacy is about educating fellow employees and the public about copyright law and raising their awareness of how copyright law affects them. WIPO Magazine’s article Understanding Copyright – A Life Skill, by Lesley Ellen Harris, discusses the importance of copyright and intellectual property education on a broad basis. Once the preserve of specialists, copyright has become a mainstream issue, and understanding how it works is an increasingly necessary life skill. In the online world, consumers come face to face with copyright law, but many remain confused and unsure about what they may or may not legally do. […] Copyright education offers a steady and sure means of building understanding and respect for creators’ rights. Many of us are exposed to copyright issues in our daily lives, often without awareness or thought. With the proliferation of internet-connected devices and digital access and sharing, we have the products of others’ creative expression in the palms of our hands — quite literally at our fingertips. Knowledge and understanding can help prevent infringement. Infringement is the unauthorized or illegal use of copyright-protected materials. It’s also important to realize that lack of copyright understanding and fear of infringement can prevent you from using readily available materials in new and inventive ways. Maria Pallante, former U.S. Register for Copyright, describes understanding copyright as a life skill, akin to reading a map or using GPS. She asserts that at least a basic understanding of copyright law is required for everyone and the level of copyright knowledge needed varies depending on your field. It’s one of those life skills now, right? When you graduate from high school or college, you should know how to read a map, you should know how to use GPS, you should know a little bit about copyright. If you are somebody who is going to be in a field where you will encounter copyrighted materials all the time, you should know more. If you’re going to be an artist or musician and you’re getting a red-hot degree in the performing arts, you should know a lot. And I don’t think that’s quite the case — I don’t think it’s been built into the curricula. It’s safe to say nearly everyone will encounter a copyright issue at some point. It may be through accessing content on sites such as Facebook, or viewing and downloading videos and music. Or, it may be while searching online for images and photographs to include in your presentation slides. Understanding copyright law and how to legally use copyright-protected content benefits you both professionally and personally. Many believe copyright literacy begins in the library. First, librarians and information professionals must learn about the principles of copyright law and licensing digital content. This is most important on a practical level so they can answer daily copyright and license compliance questions. See A Simple Guide to Copyright for Librarians. Second, as gatekeepers to content, librarians are in the obvious position of teaching others about copyright law and legally using content licensed from aggregators and online publishers. … sufficient copyright knowledge to be able to take well informed decisions on how to use copyrighted materials. It includes understanding the structure, functioning and implications of the copyright system, as laws, practices, and user expectations evolve. Copyright education is the process of developing and updating copyright literacy. Lack of knowledge may result in mis-application of the law, and lead either to infringement, or overly restrictive limits on what users can do. Librarians are often the copyright leaders in their organizations and educate and influence others, thereby shaping institutional policies and use of copyright-protected content. 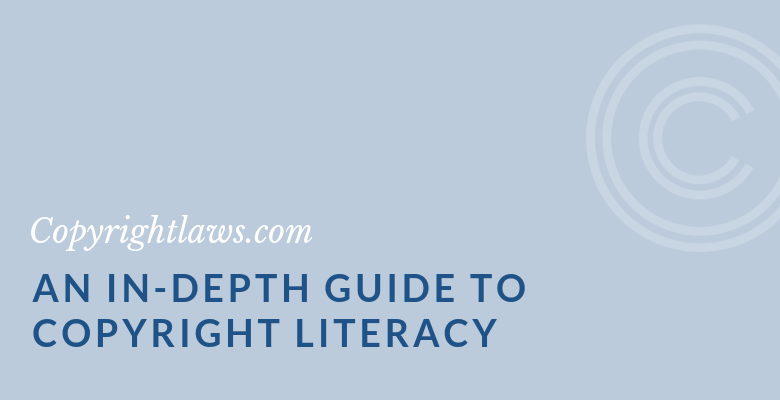 … a greater level of copyright literacy within the profession as a whole will mean that more users’ questions can be answered in a quick, confident and well-informed way. The IFLA policy statement urges all to be aware of and support copyright literacy among all information workers. It incorporates critical thinking and awareness, and an understanding of both the ethical and political issues associated with using information. […] Information literacy is associated and overlaps with other literacies, including specifically digital literacy, academic literacy and media literacy. It is not a stand-alone concept, and is aligned with other areas of knowledge and understanding. Information literacy helps to understand the ethical and legal issues associated with the use of information, including privacy, data protection, freedom of information, open access/open date and intellectual property. Libraries and resource centers in organizations of all sizes and industries (private, public and government) are frequently responsible for obtaining copyright permissions and providing information about copyright law. Libraries may also be responsible for copyright education. In some organizations, copyright administration and education may be centralized in a copyright office with a Copyright Librarian or Copyright Officer as well as a team or committee. Work with them to discover what they need and want to learn about copyright. Then create a plan and start spreading the copyright message to your audience(s). Creativity is necessary as you work to obtain support for copyright compliance from employees within your organization. Offering a variety of copyright literacy activities helps engage as many copyright stakeholders as possible in the copyright literacy effort. A Copyright Awareness Day can have many benefits for copyright compliance in your workplace. This is a day that’s dedicated to promoting copyright awareness and education through activities that are impactful for your organization. is the theme of the Developing a Copyright Education Strategy eTutorial. This online course demystifies how to increase the level of copyright literacy in your enterprise through awareness, education and training with the goal of lowering your copyright risks.